Welcome to Fluffy Butts Farms! I began with the love and expectation of only raising Seramas. I had been researching small chickens and found that they were the SMALLEST Chicken and the #1 pet in Malaysia. They are very bright birds and there are thousands of color varieties. At the time I was researching them, I had found that they didn't breed true in color and that every hatch would be a surprise. I was excited about having pet Seramas following me around like puppies! I began w/ 4 gorgeous birds from a local breeder (N. Central Florida): 2 tiny Mille Fleur Hens, a young pumpkin cockerel and a BEAUTIFUL Rainbow Rooster. They were my first but I have hatched MANY since and most of my Seramas now are their offspring! I have since fallen in love with many different varieties of chickens. It began around fall of last year, when eggs were harder to get and my incubator sat empty for 2 weeks too long. Onto BYC I went searching for hatchable eggs ... eggs of birds I thought were just TOO DARNED CUTE to pass up! 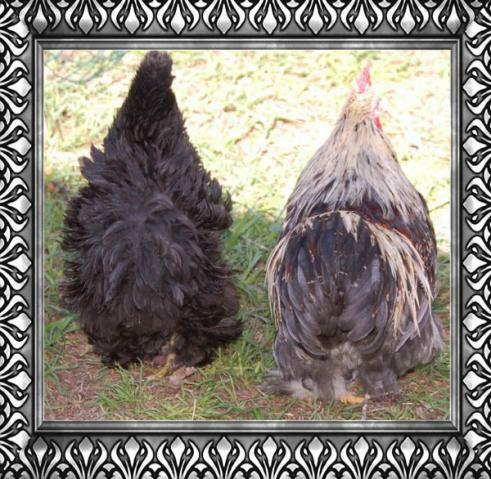 Sizzles, Frizzles, Silkies, and Marans. My new breeding program is Sizzeramas (sizzle/seramas). I will keep you updated as I can. After attending the Lake City Poultry show this year (2009), I found a friend who had been breeding Marans for a couple of years. Oddly enough he had ALSO begun a breeding program of Seramas down at his Miami farm. 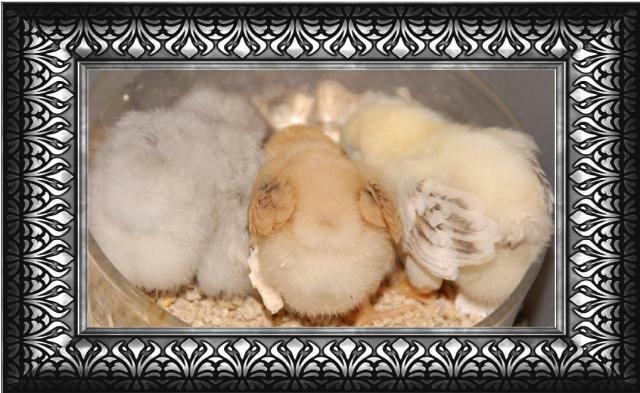 His goal was to breed true and ONLY breed for TINY light colored Seramas. When I found out, I said, "Good luck-you can't breed them true." He has proved me wrong. He began w/ birds purchased from Jerry Schexnayder in LA. I was, of course, in AWE because I had read great things on the internet about Jerry's Seramas. Since he has achieved his goal, many of his Seramas from the beginning, are now for sale.